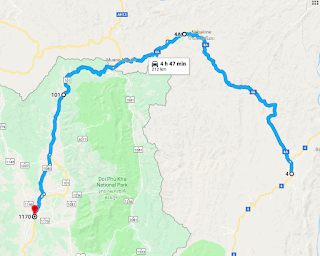 Since living in Nan province in North Thailand I always wanted to make a loop into Laos and then to Loei and then back to Nan again. But just when I came to live here the immigration of Xaraboury (Laos) barred motorbikes from crossing any borders within Xaraboury province. 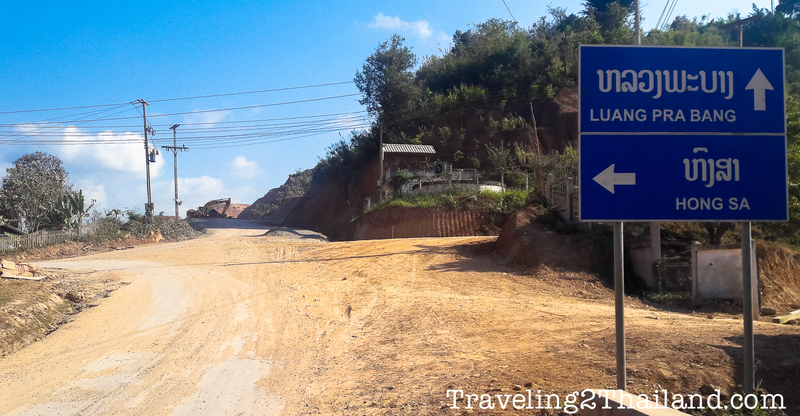 So no border crossing with motorbikes at Huai Kon (Thailand) - Muang Ngeun (Laos). But then recently the rules were changed. 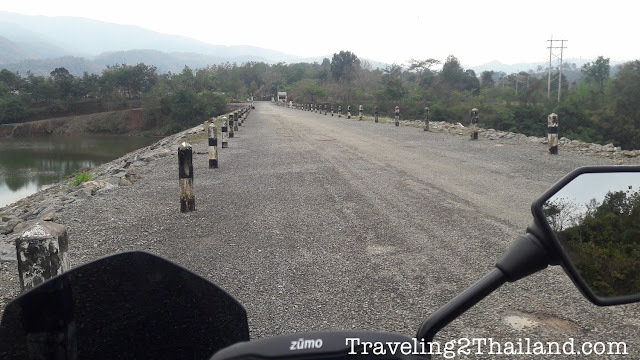 Groups would need a tour-guide but solo motorbikes would be able to just pay for the tour-guide. So 2 days before leaving I had my wife calling the local border tour agent. And again the rules were changed, ALL motorbikes will need a tour-guide. So what to do? 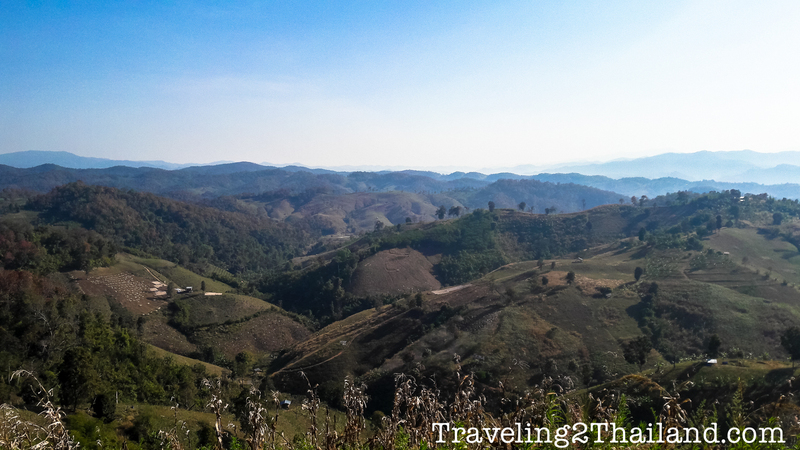 Following is my Just Back Report with photos and route of a wonderful Nan - Loei - Laos - Nan loop. As there were some people saying that motorbikes can still cross the border at Huai Kon I started this tour with a fact finding mission .... going myself to the border and check it myself. So the first day started with a beautiful foggy sunrise along route 101 to Pua, Chiang Klang, Thung Chang and then to the Huai Kon border, where of course I was denied entrance to Laos. 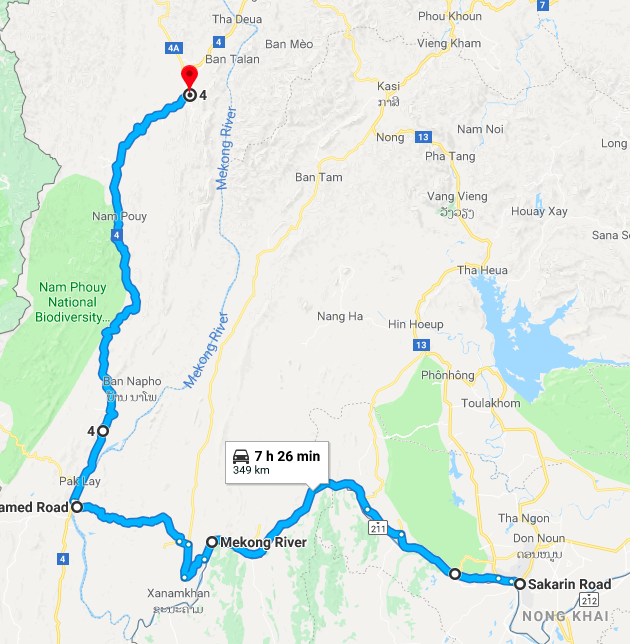 So I skipped going into Laos here and decided to make the Nan - Laos - Loei loop the other way around. So I continued on route 1081 to Bo Klua, that is at many part not in good condition with a lot of put holes and even with some road construction work going on. 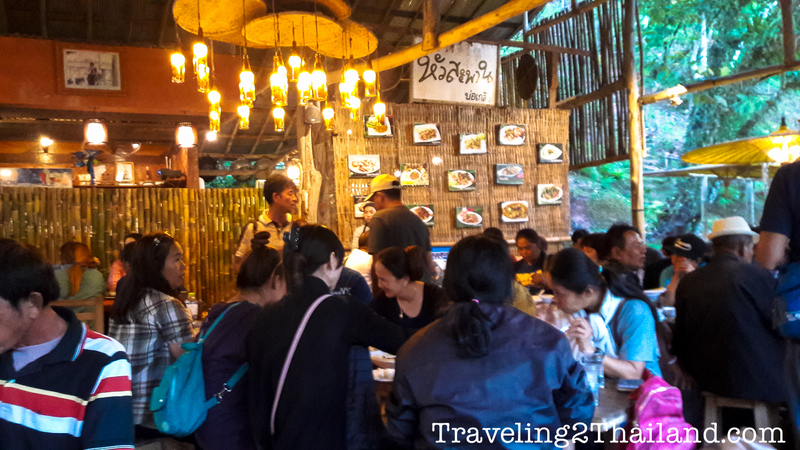 I explored the area Bo Klua and found out that it was busy with Thai tourists and many hotels were fully booked. 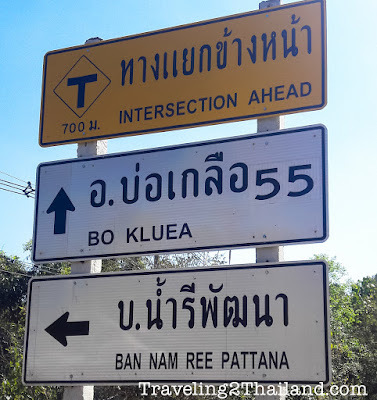 So I stayed at Bo Klua Fai Resort. 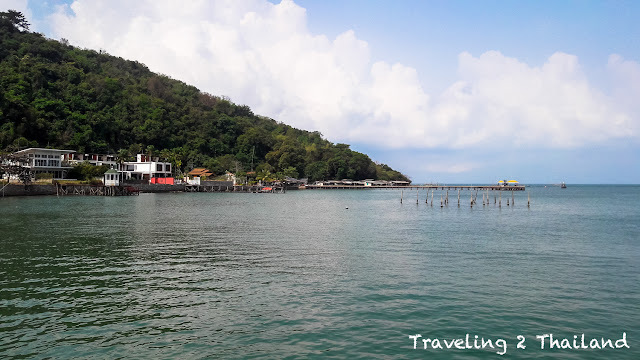 This resort has a few older wooden bungalows, a few newer bungalows and a main building with 10 room. 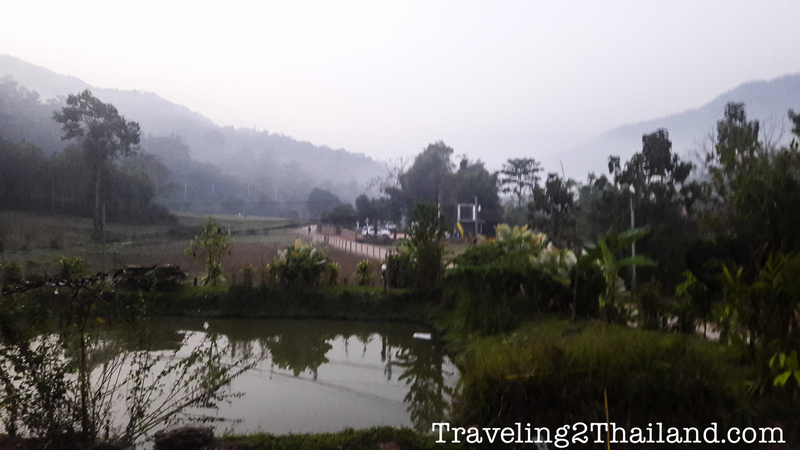 That is where I did stay and later a group of motorbike riders from Rayong did show up. One of them was riding a big fat HD. Respect for riding that on the curvy route 1256! 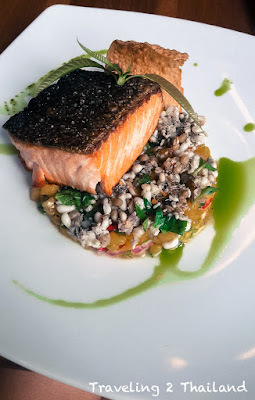 In the evening I had a delicious dinner at the small restaurant near the bridges. Highly recommended! 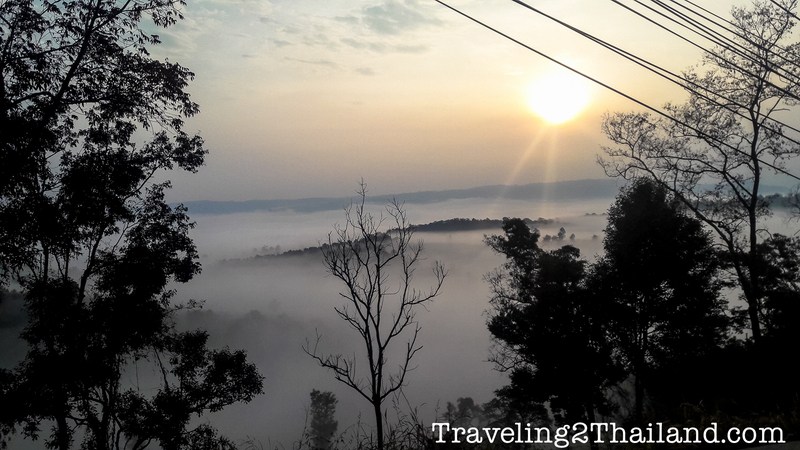 The next morning I made a foggy ride back to Tha Wang Pha again and did stay 1 night home. A total trip of 280km in 1 day and a morning ride back home. 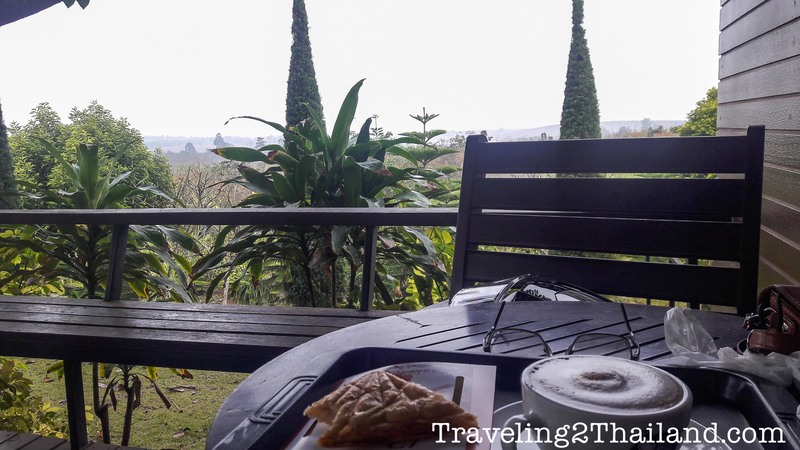 In the morning I did meet two other motorbike riders at the PTT gasoline station in Tha Wang Pha where I also had my famous bikers breakfast. 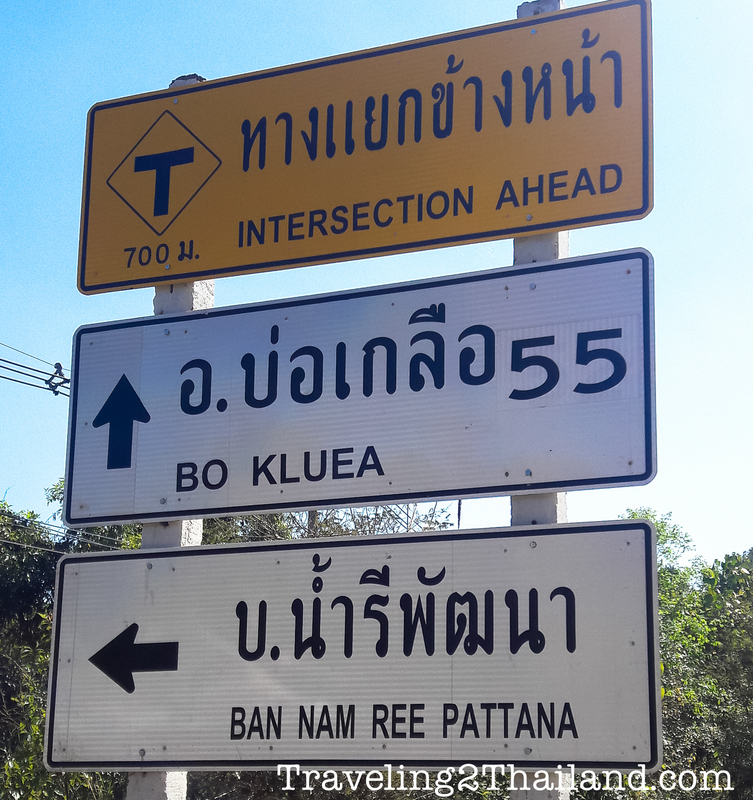 After breakfast I took route 1170 to Sila Phet and route 1081 & 1169 to Santisuk. 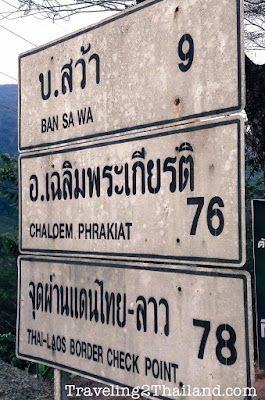 Followed by route 1225 & 1168 to Mae Charim. 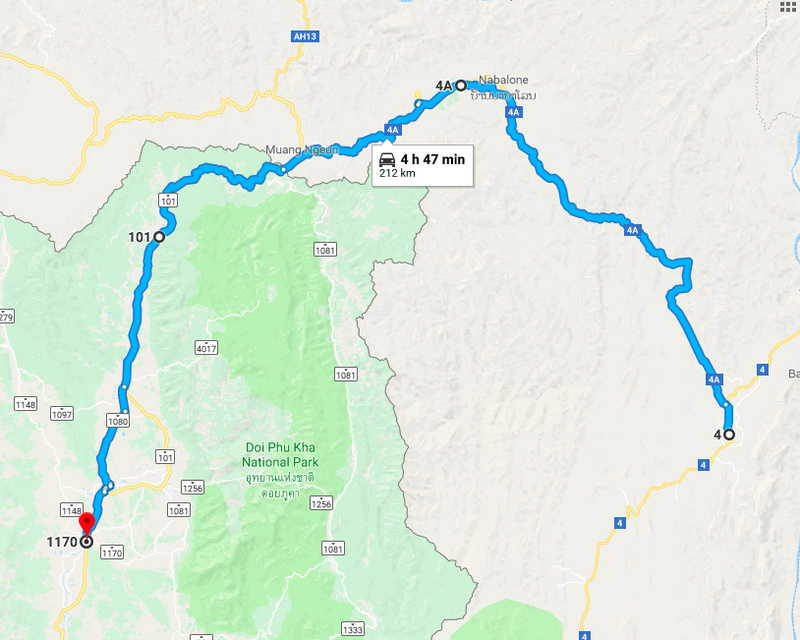 And then route 1243 to Bo Bia and route 1241 & 1268 to Phu Soi Dao and Na Heao. 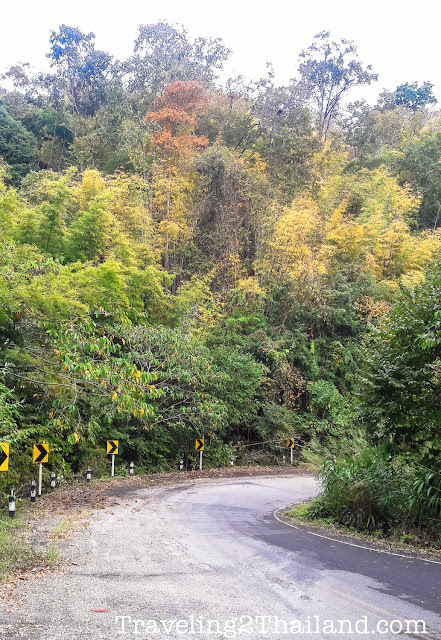 All roads very fine until route 1243, albeit it had been raining the night before so roads were wet and sometimes there were a lot of wet leaves on the road. Not very pleasant riding conditions. And as you can see on the somewhat dark photos it was cloudy. Route 1243 is a mix of mostly put holed road and some "new" stretched (although they were now also not in such a good condition anymore). 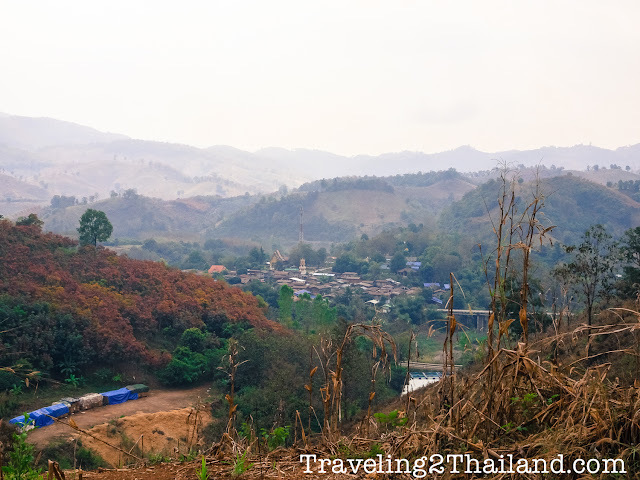 Traveling in this corner of North Thailand is truly off the beaten track and you hardly see any other people. Not a good place to get a flat tyre! This day I would make a total of 320km and ended late (what I normally never do). 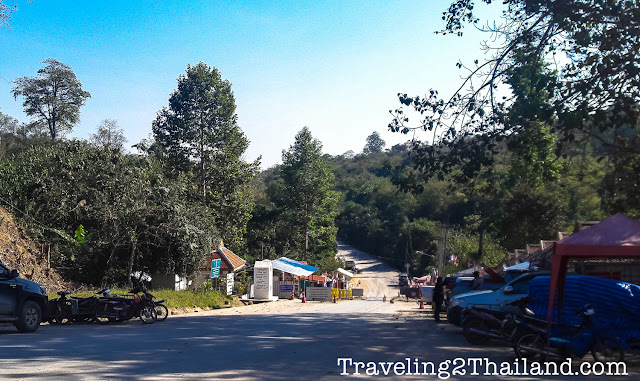 At the Nam Tok Phu Soi Dao I made a rest stop and to my surprise I did meet 2 fellow countryman who were independently traveling by car in North- and North-East Thailand. 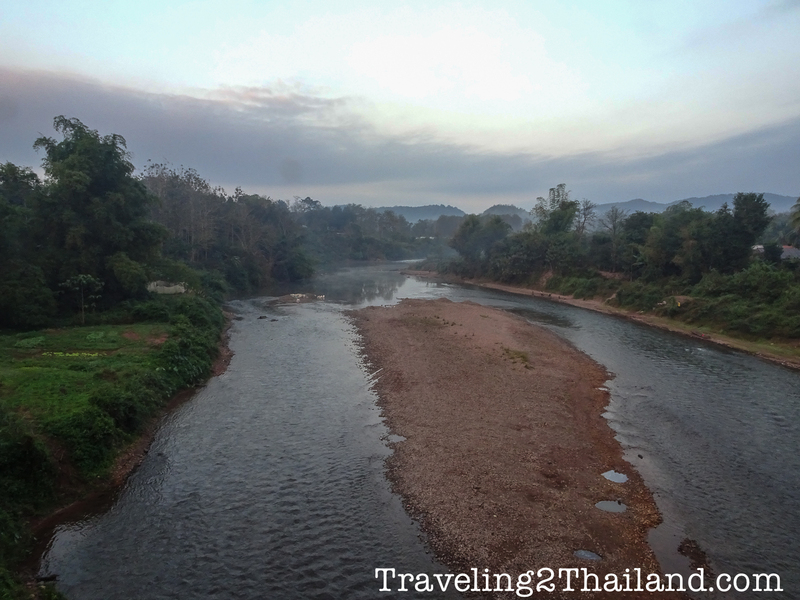 As said there is not much in the corner of North Thailand, also no hotels or guesthouses. 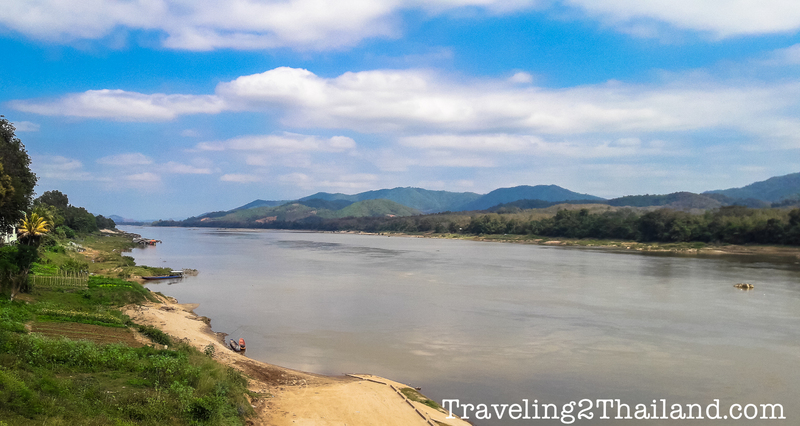 So I continued all the way to Na Heao where I did arrive at about 17:00. 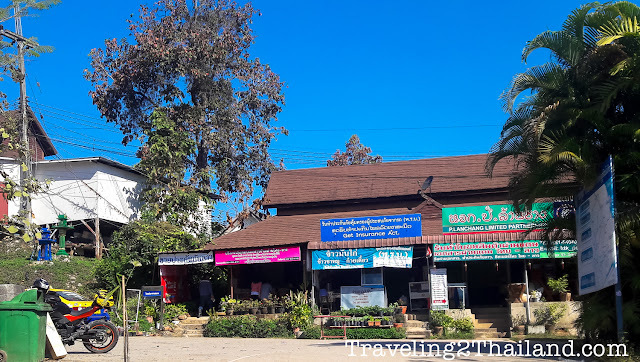 I did stay at Eng Mork Guesthouse, not a great place to stay but no better choice. Good that the new owner now also has a restaurant so I had my famous Khao Phad Pak as dinner there. As there is nothing to do in Na Heao I went to sleep early. I did wake-up early and left without breakfast. 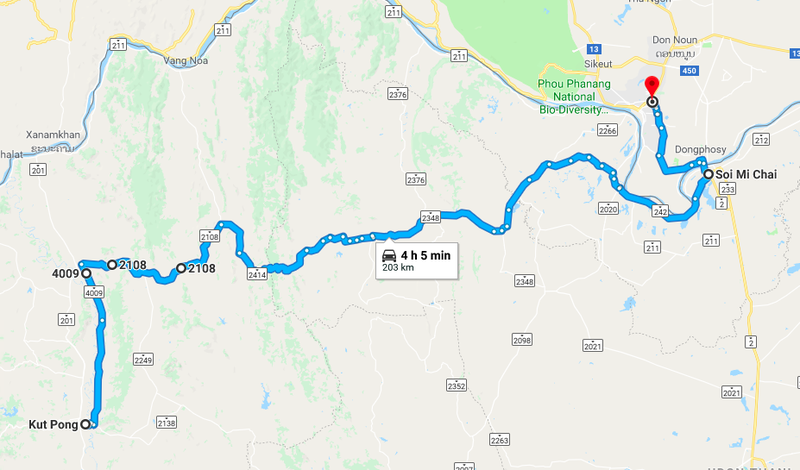 I wanted to go to Loei and there are from Na Heao 2 ways to go to Loei. I did choose the easy route as it was very very foggy. 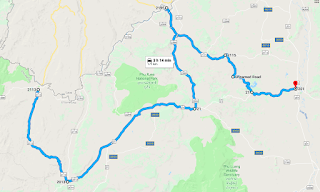 So I took route 2113 to Dan Sai and route 2013 & 21 to Phu Reua. 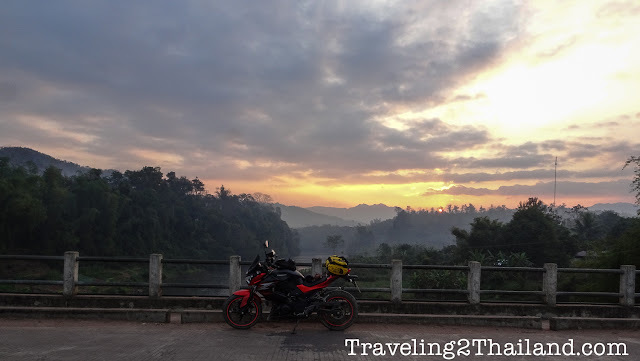 Along route 21 I had another famous bikers breakfast at a PTT gasoline station. As I was now "near" Thali I decided to make a detour and check if I could cross the border there. 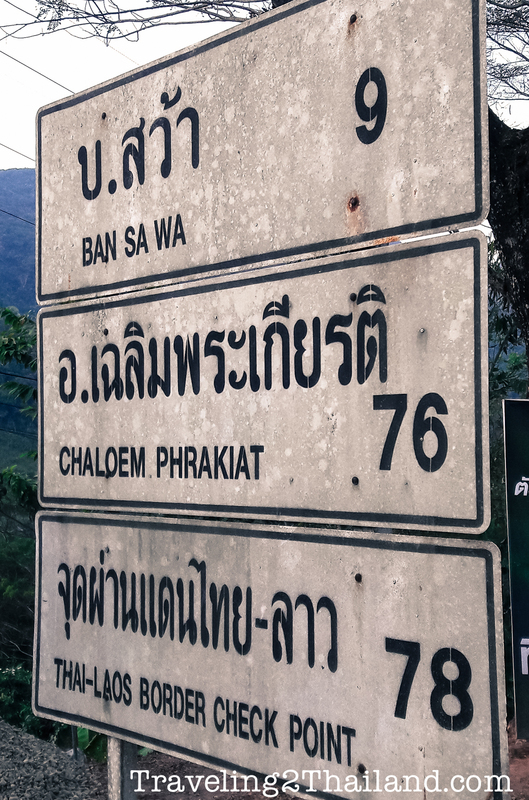 So I took route 2399 to Thali. 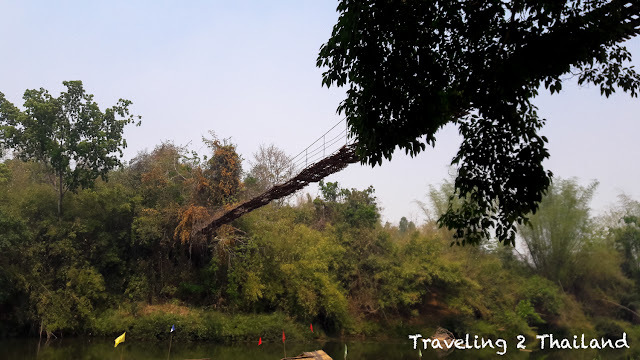 But of course again I was denied access and was recommended to go to Nong Khai. 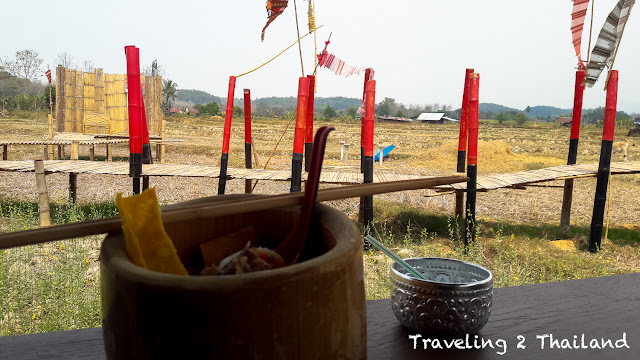 So I took a short-cut route to Loei via route 2115 and passing the beautiful Huai Krating lake where you can lunch on bamboo rafts. I love that lake! Passing Dan Sai and Phu Reua I was surprised to see the growing of tourism in this area. Many new hotels, restaurants and markets along the road. And it was busy also. 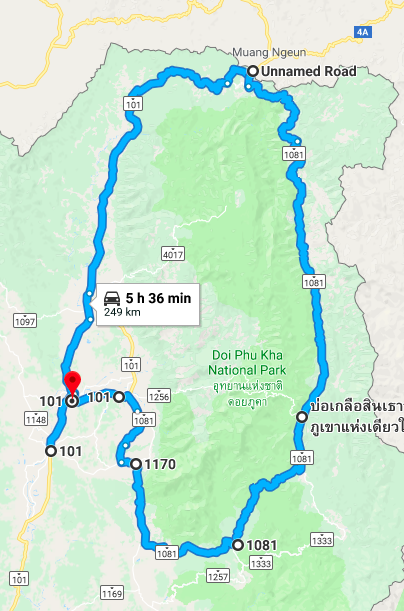 As the total distance today was only 171km I arrived early in Loei town and decide to have some comfort and stayed at Loei Palace Hotel. In day time Loei town is pretty boring but in the evening it is quite nice. International Thai - Lao border at Thali in Loei - Thailand. After a luxury breakfast at Loei Palace Hotel I left for my ride from Loei to Nong Khai and finally Vientiane in Laos. I decided to take the short-cut route but made a few mistakes and it ended not being such a short-cut as I thought. Basically route 4009, 2108, 2314, 2348 and route 242. 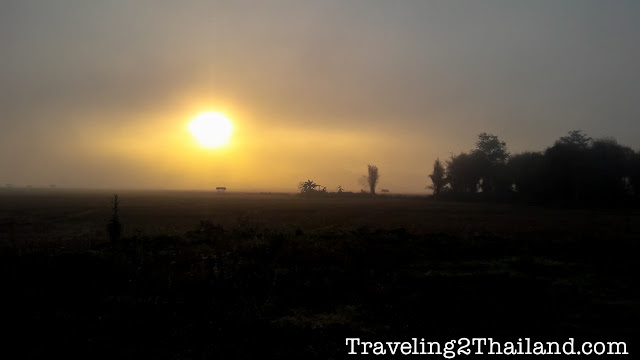 A total of 203km and the first 50km were very very foggy and with road construction going on. Not a pleasant ride this day. Crossing the International Thai - Lao border at the Thai - Lao Friendship Bridge was a breeze. It took me in total 1 hour. 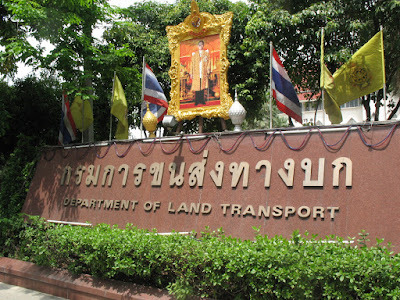 First customs & immigration of Thailand, the riding over the bridge to cross the Mekong River, then applying & getting a visa for Laos, then immigration & customs in Laos. 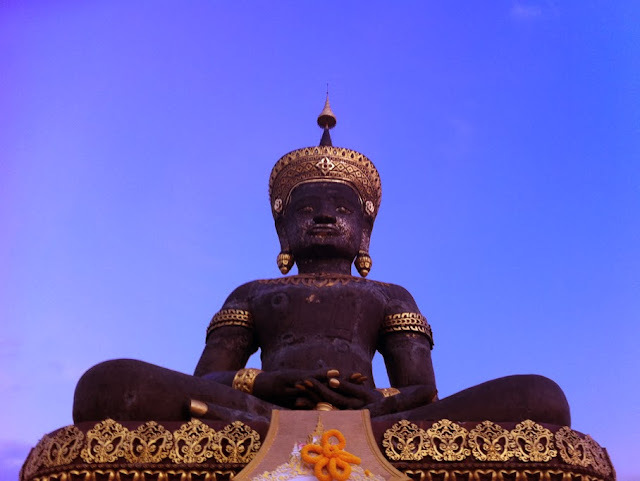 And finally buying a insurance for Laos. 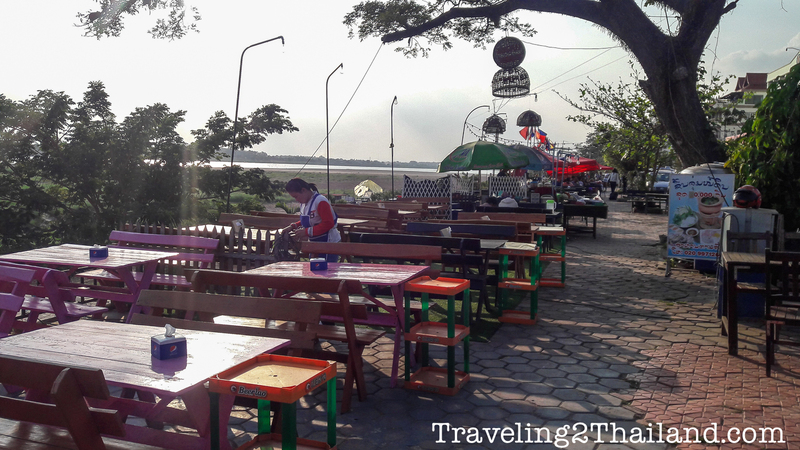 Then a slow 20km ride into Vientiane city, riding on the RIGHT side of the road! I did stay at Seasons Riverside Hotel and as the name tells you it is right along the Mekong River. Good location but not recommended hotel. In the evening I had a delicious French dinner and walked over the for me new boulevard. 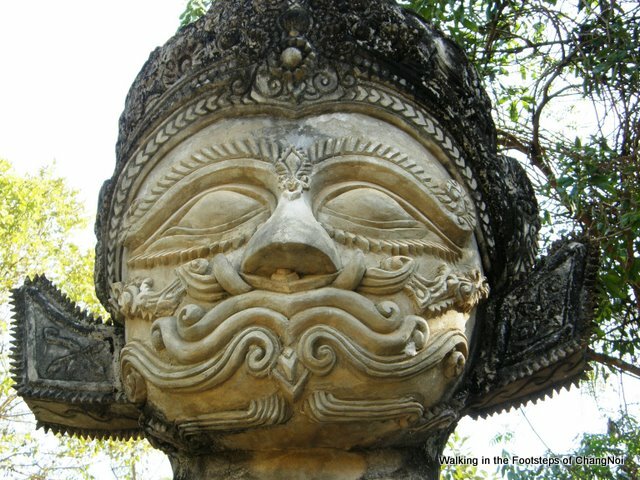 I like Vientiane. Traffic jam in Vientiane, Laos! After a bit lousy breakfast in my hotel I started to first leg of the ride today, from Vientiane to Paklay along the Mekong River. 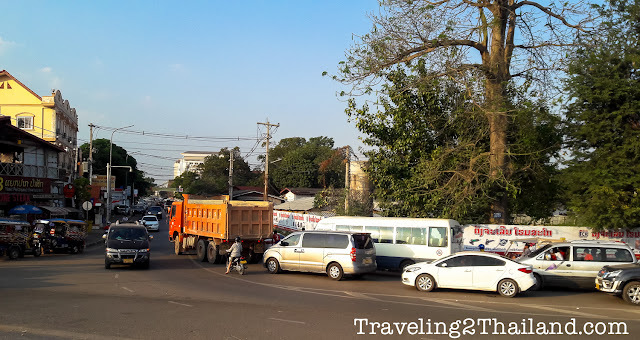 Well that did mean first getting out of Vientiane center in the morning traffic. And then exiting Vientiane city. All together that took my almost 45min! 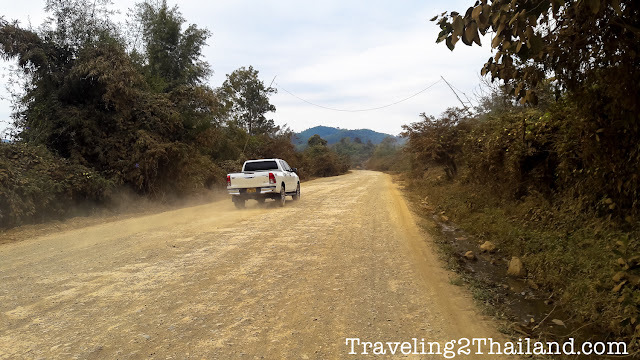 The road along the Mekong River is good for about the first 80km but the starts a kind of dirt road with sand, gravel and stones. Very unpleasant riding and that continues for about 40km! Then you will get at a T-intersection just after a kind of bailey-bridge. To the left is the old road to Xanakhan, to the right is to Paklay. And that is where the better road starts again. All the way to Paklay is a good road with some put holes. 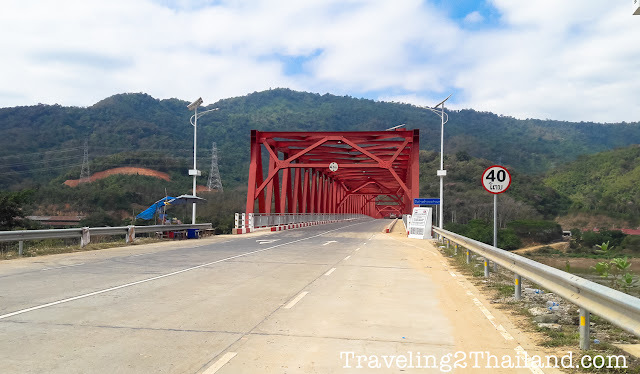 The bridge crossing the Mekong River at Paklay is finished so you do not have to take the ferry anymore. For some locals the bridge seems to be a kind of attraction point and they park their car on the middle of the bridge for a family picnic (no joke) on the bridge. 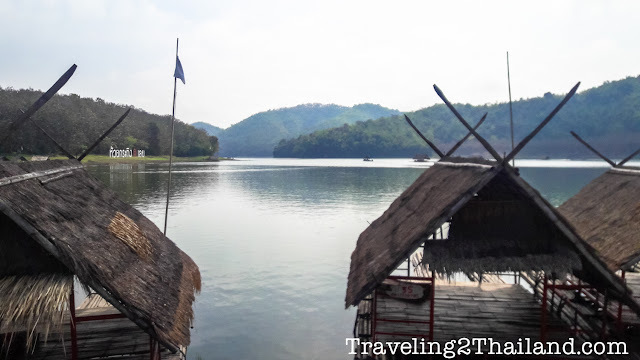 In Paklay are guesthouses and restaurants, so if I would not have arrived here at 12:00am I would have stayed here. But I had only lunch here and continued to Xayaboury, what was a bit of a mistake. 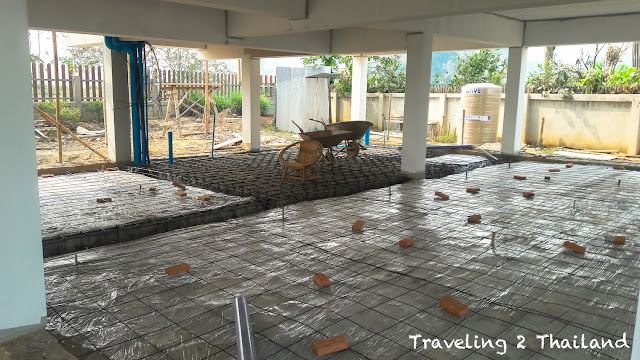 Although the road is surfaced it also has a lot of put holes. So the average speed was low. As a matter a fact the all road to Xayaboury has deteriorated a lot since 5 years ago when I took this route. So I arrived at about 17:00 in Xayaboury after a 350km riding all day. As there is nothing to do in Xayaboury I did sleep again early and did wake-up early. So I skipped breakfast and started riding to Hongsa via route 4A. And although it is only 90km it took me about 3 hours! Route 4A is one big mess of put holes, missing road parts, gravel, road construction and some very very slow huge trucks on the steep mountains. This was a very unpleasant 3 hours riding. And again this road was much better 5 years ago. 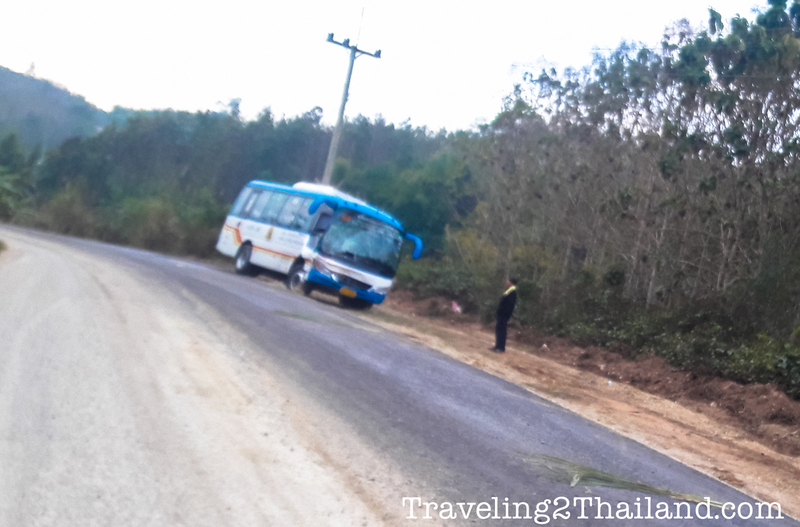 Along the road I saw the bus Nan - Luang Prabang with a smashed front side. And a big oil truck that slipped of the road with 2 wheels (and now blocking half of the road). Unfortunetly it was clouded, otherwise the scenery along the route is stunning beautiful. And it was not only clouded but also bloody cold! 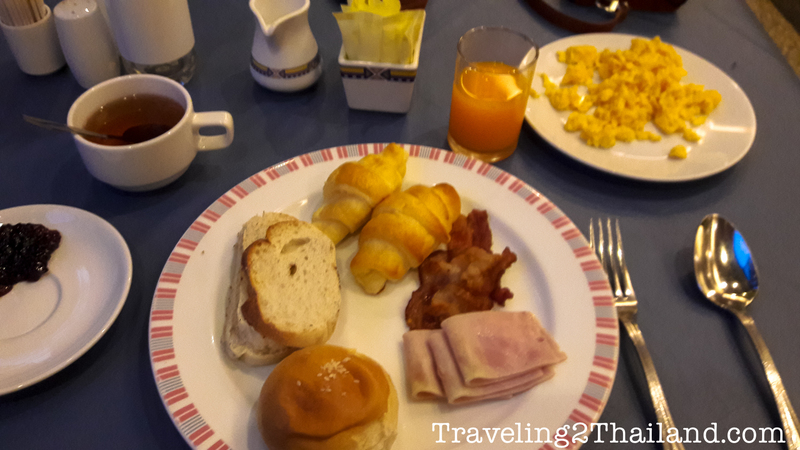 So I arrived about 10:00am in Hongsa and had a belated breakfast at a local restaurant. 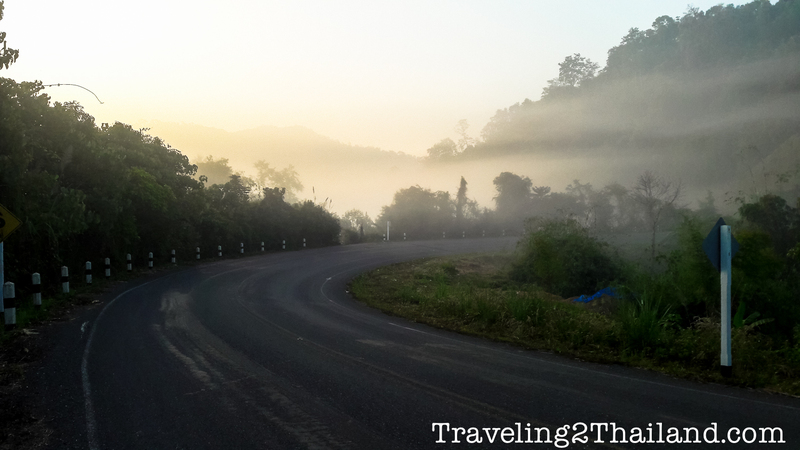 After my breakfast I continued to the border with Thailand. 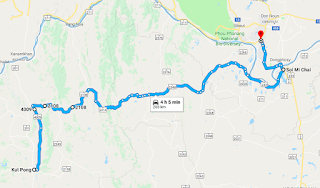 The last 20km is a still very good divided highway. Still almost the same condition as 5 years ago! Who did build this road? 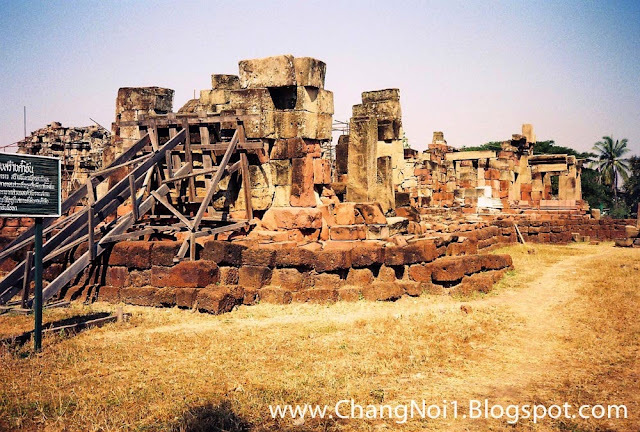 The Chinese from Hongsa Power Plant? 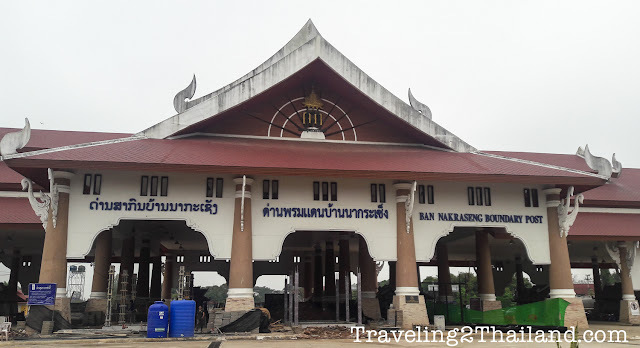 Crossing the International Thai - Lao border at Meung Ngeun (Laos) and Huai Kon (Thailand) was very easy, friendly and efficient. It took me about 20min all together. 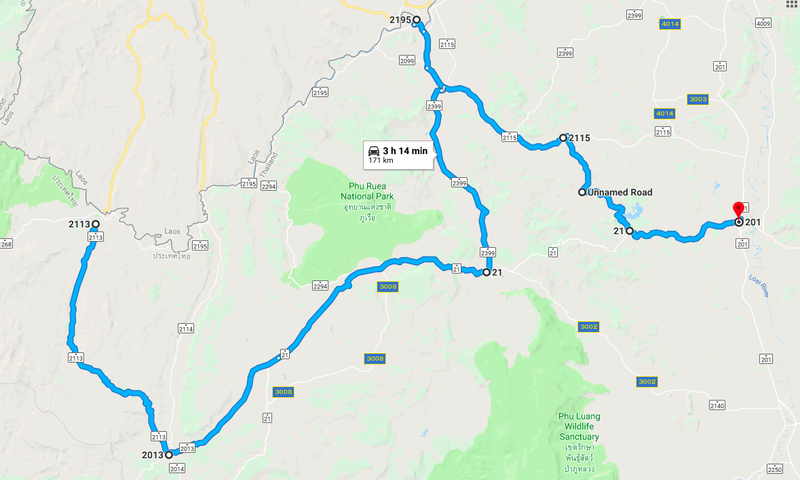 After that it was another 95km back to Tha Wang Pha via route 101. 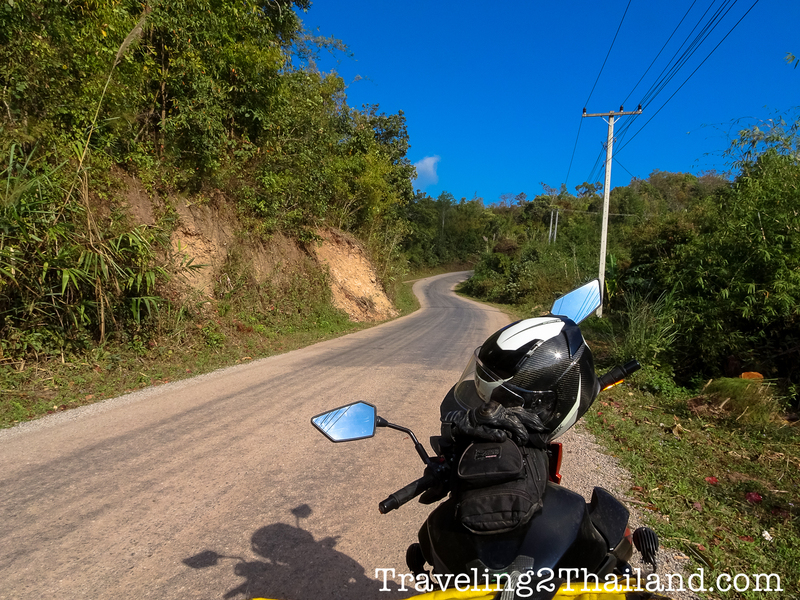 Wow I started to love Thai roads! 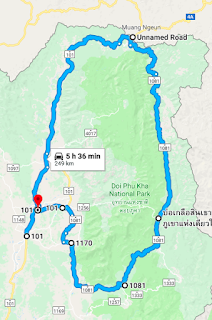 Today trip was 212km.